SLS Nike SB Pro Open, second day review. 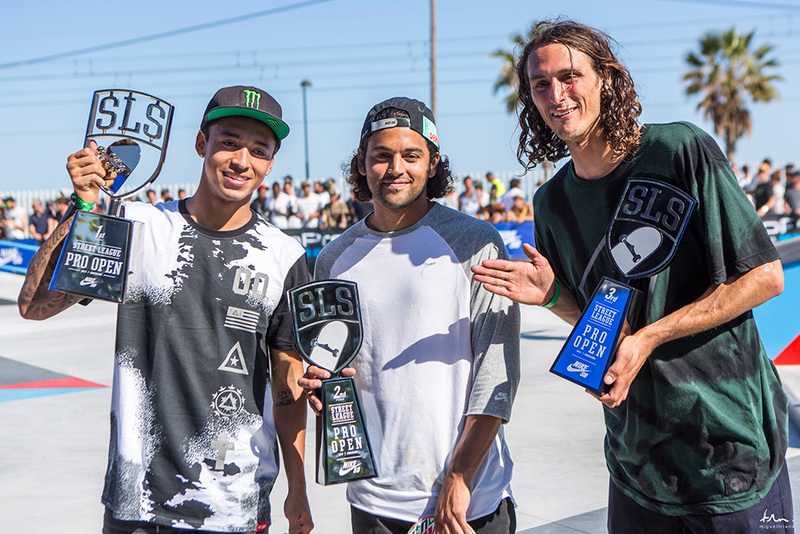 Amazing victory of Nyjah Huston in the SLS Nike SB Pro Open at the last moment. There is nothing new on Nyjah winning, because he usually does, but not in the way he did today. He did not skated as good as he used to during the entire final session away from the top. However, when last chance to win came and had to risk everything to climb from seventh position, he landed a backside 360 kickflip lipslide on the rail of the stairs, scoring 9.3 points and took first position. Still had to score Shane O’Neill, Chaz Ortiz and Paul Rodriguez. Shane missed his attempt in the largest rail, just before he had done switch 360 double kickflip on the stairs. Chaz tried on the ledge a backside kickflip tailslide to backside flip out and also failed. There was only Paul Rodriguez, who was on second position to jeopardize Nyjah´s victory. He risked everything in the small rail with nollie krooked grind to nollie heelflip out that actually landed but could not rolled away, just before had done a krooked grind nollie heelflip out on the big rail. Third position was for Evan Smith, who was on fire all day long, with great airs in the quarter pipe and a huge ollie over the planter on the ground. Which earned him a place in the SLS Nike SB Pro World Tour, along with Cody McEntire that showed great consistency and technique in his tricks throughout the weekend. Right after the awards ceremony by legendary special guest Enrique Lorenzo took place on Diamond Supply Co. Best Trick Contest. The winner was Felipe Gustavo with a switch kickflip backide tailslide on the hubba.